Solange is one of those performers whose personality shines right on through to the audience: Her smile, her voice, her moves—she’s a great performer, and she looks awesome while she’s up there. Maybe it’s the hair, but when Solange hopped on stage Sunday evening at Northside Festival in Williamsburg, her look was a little more Brooklyn than I'm used to seeing. On Sunday, when she showed up in denim cutoffs, a striped tee, braids all the way down her back, and a baseball hat, I was surprised. She looked awesome, don't get me wrong. (Who can pull off those shoes but Solange?) But looking at the images, I was desperately craving the oomph. I appreciate that she dressed for the setting and the occasion, but I think I prefer her the glam way. 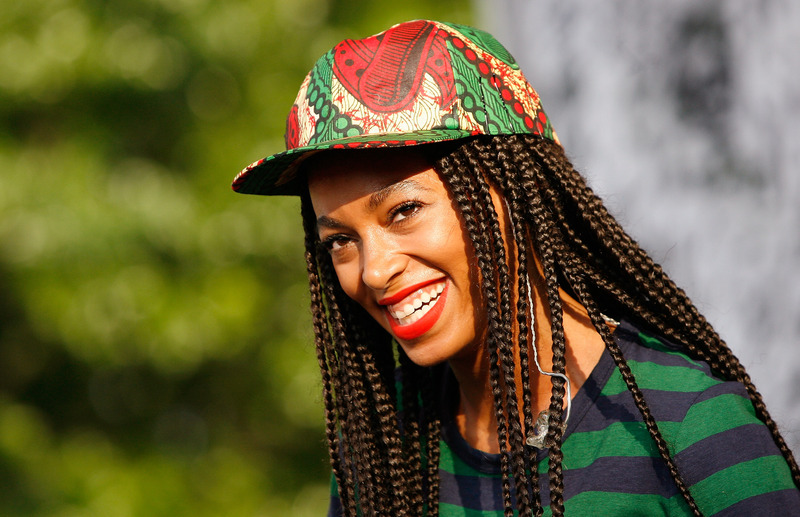 Totally unique and completely glowing—in only the way Solange could do it.